We went to Seattle last weekend. While last our visit in January 2013 has a shopping as purpose (there are some serious shopping malls in Tulalip) this time we wanted to see more of what city can offer. 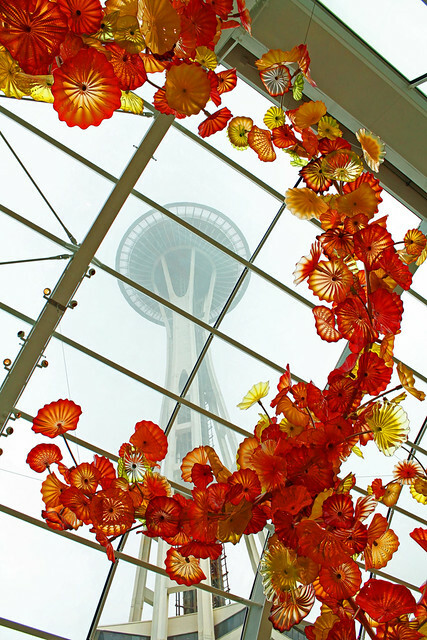 Unfortunately, weekend is too short for thorough exploration so we focused on two things we wanted to visit since last time: Chihuly Garden and Glass gallery and Space Needle. One is right next to the other so we didn’t waste too much time trying to find them 😛 Besides, they are bot just few minutes by famous Seattle monorail from downtown. 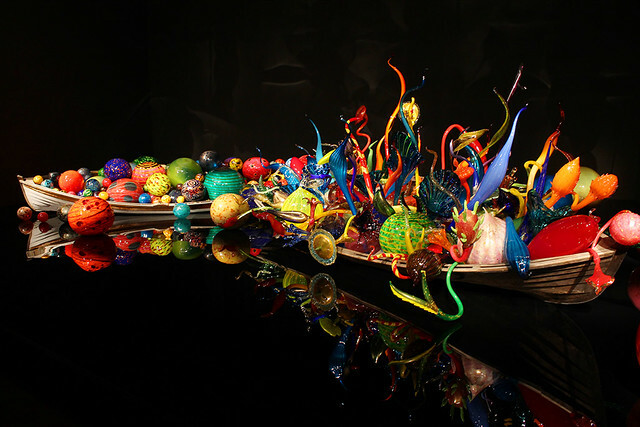 People interested in art are probably familiar with a name of Dale Chihuly. Despite all of his injuries, he managed to stay with his art. Quite amazing! The rest of the photographs I made you can find here. 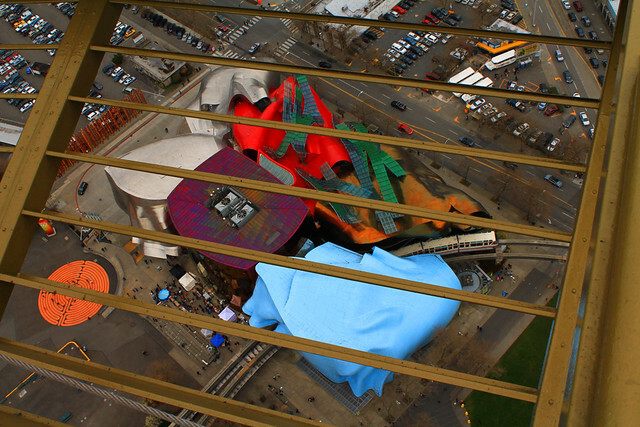 Space Needle, an 184m (605ft) high observation tower is right near the Chihuly Glass and Garden museum. 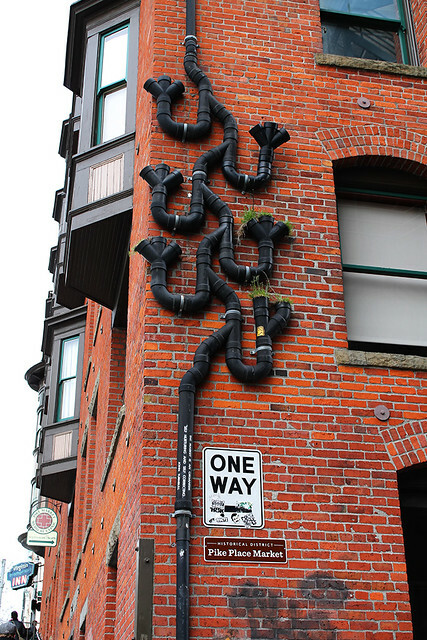 Love the downspout! Makes me want to try something similar. 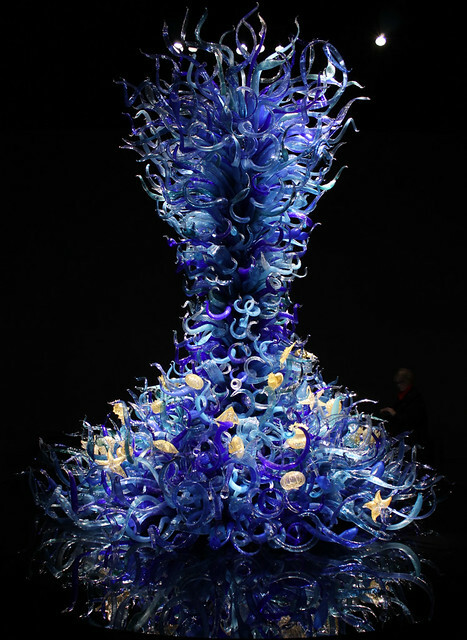 Chihuly’s work always makes me think of Wyndham’s “The Kraken Wakes” (published here as “Out of the Deeps”), and the one labeled “Sea Life” seems to fit it perfectly. We have a couple of his (Chihuly’s) things here, I think … at least one in the Milwaukee Art Museum … they always make me kinda nervous. I don’t like to get too near them; they look so breakable. Yes … my mum was like that … very tactile person. I reckon that’s why weaving appealed to her. Beautiful shots and thanks for the tour of the city. I’ve been through Seattle a couple of times but I’ve never really explored it. I’m so glad you got to see some Chihuly glass art in person. It really is amazing. Also glad you enjoyed Seattle. I was there a few times when my sister lived there for 25 years. During one trip, we took a couple of ferry boat rides to different islands. One was Tillicum where we had salmon (me for the first time) cooked by Native Americans (I’m sorry, I forget what tribe). It was cooked on sticks over a fire outside and we ate inside, in a Long House. Another ferry took us to Orca’s Island where I had more salmon at a wonderful restaurant called Christina’s (I don’t know if it is still there). We also took a walk through ‘Enchanted Forrest’ to a ceramic studio and store. All through the walk were pieces of colorful, broken pieces of ceramic embedded in the dirt and trees. Truly, a very enchanting place. Now that sounds like a good idea for one of next visits! On a way to Seattle, we stopped in Everett. In a hotel, we asked for them to recommend some good sea food restaurant. They gave us a list and three most popular ones were, of course, on Pacific beach. And there were no single table available. Obviously, salmon, and probably other sea food is very popular there 😀 We ended up in some Cuban restaurant and food was equally perfect!!! That glasswork is amazing! I’ve not come across Chihulu before, but that’s quite astounding. Interesting to read about his background as well. Looks like a good trip (I knew nothing about Seattle). “The city itself seems to be in favor to different kinds of art” what kind of city where one can see beauty everywhere.very beautiful shots , thanks for sharing .